The cheetah is a large cat of the subfamily Felinae that occurs in Southern, North and East Africa and a few localities in Iran. The species is IUCN Red Listed as vulnerable, as it suffered a substantial decline in its historic range in the 20th century due to habitat loss, poaching, illegal pet trade, and conflict with humans. By 2016, the global cheetah population has been estimated at approximately 7,100 individuals in the wild. 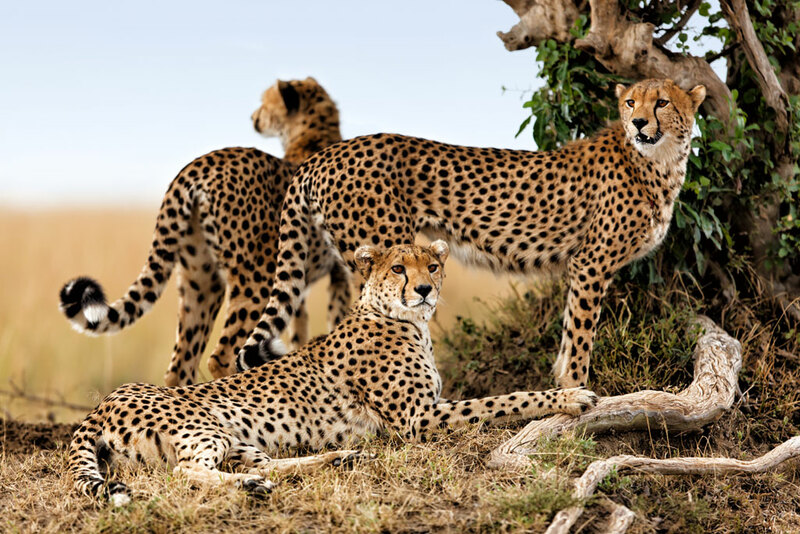 Several African countries have taken steps to improve cheetah conservation measures. It is the fastest land animal. The only extant member of the genus Acinonyx, the cheetah was formally described by Johann Christian Daniel von Schreber in 1775. The cheetah is characterised by a slender body, deep chest, spotted coat, small rounded head, black tear-like streaks on the face, long thin legs and long spotted tail. Its lightly built, slender form is in sharp contrast with the robust build of the big cats, making it more similar to the cougar. The cheetah reaches nearly 70 to 90 cm (28 to 35 in) at the shoulder, and weighs 21–72 kg (46–159 lb). Though taller than the leopard, it is notably smaller than the lion. Typically yellowish tan or rufous to greyish white, the coat is uniformly covered with nearly 2,000 solid black spots. Cheetahs are active mainly during the day, with hunting their major activity. Adult males are sociable despite their territoriality, forming groups called coalitions. Females are not territorial; they may be solitary or live with their offspring in home ranges. Carnivores, cheetah mainly prey upon antelopes and gazelles. They will stalk their prey to within 100–300 m (330–980 ft), charge towards it and kill it by tripping it during the chase and biting its throat to suffocate it to death. Cheetahs can reach speeds of 112 km/h (70 mph) in short bursts, but this is disputed by more recent measurements. The average speed of cheetahs is about 64 km/h (40 mph). Cheetahs are induced ovulators, breeding throughout the year. Gestation is nearly three months long, resulting in a litter of typically three to five cubs (the number can vary from one to eight). Weaning occurs at six months; siblings tend to stay together for some time. Cheetah cubs face higher mortality than most other mammals, especially in the Serengeti region. Cheetahs inhabit a variety of habitats – dry forests, scrub forests and savannahs. Because of its prowess at hunting, the cheetah was tamed and used to kill game at hunts in the past. The animal has been widely depicted in art, literature, advertising and animation. The king cheetah is a variety of cheetah with a rare mutation for cream-coloured fur marked with large, blotchy spots and three dark, wide stripes extending from their neck to the tail. In 1926 Major A. Cooper wrote about an animal he had shot near modern-day Harare. Describing the animal, he noted its remarkable similarity to the cheetah, but the body of this individual was covered with fur as thick as that of a snow leopard and the spots merged to form stripes. He suggested that it could be a cross between a leopard and a cheetah. After further similar animals were discovered, it was established they were similar to the cheetah in having non-retractable claws – a characteristic feature of the cheetah. In May 1981 two spotted sisters gave birth at the De Wildt Cheetah and Wildlife Centre (South Africa), and each litter contained one king cheetah. Each sister had mated with a wild male from the Transvaal region (where king cheetahs had been recorded). Further king cheetahs were later born at the Centre. They have been known to exist in Zimbabwe, Botswana and northern Transvaal. In 2012 the cause of this alternative coat pattern was found to be a mutation in the gene for transmembrane aminopeptidase Q (Taqpep), the same gene responsible for the striped "mackerel" versus blotchy "classic" patterning seen in tabby cats. Hence, genetically the king cheetah is simply a variety of the common cheetah and not a separate species. This case is similar to that of the black panthers. The appearance is caused by a mutation in a recessive gene. As a result, if two mating cheetahs have the same gene, then a quarter of their offspring can be expected to be king cheetahs. The cheetah is a felid with several distinctive features – a slender body, deep chest, spotted pelage, a small rounded head, black tear-like streaks on the face, long thin legs and a long spotted tail. Its lightly built, slender form is in sharp contrast with the robust build of the big cats. The head-and-body length ranges from 112–150 centimetres (44–59 in). Adult cheetahs average 70–90 cm (28–35 in) at the shoulder, and weigh 21–72 kilograms (46–159 lb). It is taller than the leopard, which stands nearly 55–70 centimetres (22–28 in) at the shoulder. The weight range of the cheetah overlaps with that of the leopard, which weighs 28–65 kilograms (62–143 lb). On the other hand, the cheetah is significantly shorter than the lion, whose average height is nearly 120 centimetres (47 in). Moreover, it is much lighter than the lion, among which females weigh 126 kilograms (278 lb) and the much heavier males weigh 186 kilograms (410 lb). Based on measurements, the smallest cheetahs have been reported from the Sahara, northeastern Africa and Iran. A sexually dimorphic species, males are generally larger than females. The head is small and rounded. Saharan cheetah have narrow canine faces. Small, short, and rounded, the ears are marked by black patches on the back; the edges and base of the ears are tawny. The high-set eyes have round pupils. The whiskers, shorter and fewer in number than those of other felids, are fine and inconspicuous. The pronounced tear streaks are unique to the cheetah. These streaks originate from the corner of the eyes and run down the nose to the mouth. Their role is obscure – they may be serving as a shield for the eyes against the sun's glare, a helpful feature as the cheetah hunts mainly during the day; another purpose could be to define facial expressions. Basically yellowish tan or rufous to greyish white, the coat of the cheetah is uniformly covered with nearly 2,000 solid black spots. The upper parts are in stark contrast to the underbelly, which is completely white. Each spot measures nearly 3.2–5.1 centimetres (1.3–2.0 in) across. Every cheetah has a unique pattern of spots on its coat; hence, this serves as a distinct identity for each individual. Cheetah fur is short and often coarse. Fluffy fur covers the chest and the ventral side. Several colour morphs of the cheetah have been identified, including melanistic and albino forms. Black cheetah have been observed in Kenya and Zambia. In 1877–1878, English zoologist Philip Sclater described two partially albino specimens from South Africa. A ticked (tabby) cheetah was photographed in Kenya in 2012. Juveniles are typically dark with long, loose, blue to grey hair. A short mane, about 8 centimetres (3.1 in) long, on the neck and the shoulders, is all that remains of the cape in adults. The exceptionally long and muscular tail measures 60–80 centimetres (24–31 in), and ends in a bushy white tuft. While the first two-thirds of the tail are covered in spots, the final part is marked with four to six dark rings or stripes. The arrangement of the terminal stripes of the tail differs among individuals, but the stripe patterns of siblings are very similar. In fact, the tail of an individual will typically resemble its siblings' to a greater extent than it resembles its mother's or any other individual's.